CUSTOM TEMPORARY TATTOO PAPER - Print virtually any picture imaginable from your computer, and have it on your skin as a temporary tattoo in minutes - without the pain or regret of having an actual tattoo! Whether you designed the image yourself or found it online, it can be worn by you using our printable and customizable transfer paper for your inkjet or laser printer. 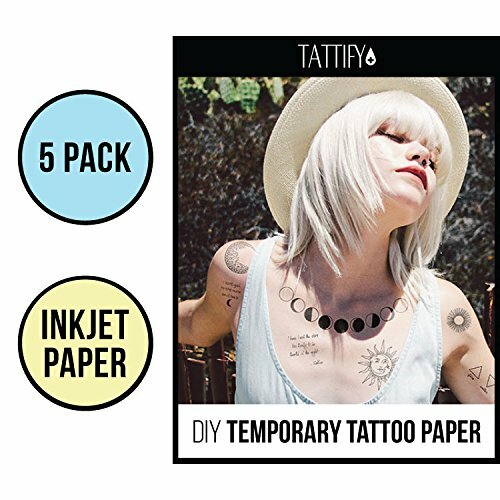 Useful for creatives who want to control the size and color of their DIY temporary tattoos in order to express themselves. EASY TO PRINT, SAFE TO APPLY AND REMOVE - See our "product description" below for detailed instructions outlining the entire process of using our printable temporary tattoo paper. Use whatever image editing software you like - Photoshop, Illustrator, Powerpoint, and Word are all compatible software. Using a printer and scissors is all you need once printed. We value your health and do not use any toxic chemicals in our products - so our temporary tattoo transfer paper is children friendly! WATERPROOF AND SWEAT RESISTANT - Sometimes customers use our temporary tattoos as part of a costume for a lengthy event, and it must last more than one day. Tattify has you covered when it comes to durability - these can last up to five days! Dancers have worn our tattoo sheets for multiple nights at a time and they still survived after all that sweat. Please note that our DIY tattoos do not wash off easily in the shower - you are best off using baby oil to remove. WHO'S IT FOR? - Really anyone can rock Tattify tattoos, but our more specialized audience may fall into the categories of costume designers, makeup artists, and creatives. Perfect for Halloween, cosplays, photoshoots, club nights, birthdays, arts and crafts projects, festivals, charity events, and sports games. We may have forgot to mention that our print temporary tattoos are not necessarily ONLY for skin. They can be applied to anything such as wood, nails, even the walls in your house! 360 DAY MONEY BACK GUARANTEE - That's right! You're protected by our bold 360-day, no questions asked, money back guarantee! Things happen. Sometimes the tattoo paper gets stuck in your printer, sometimes the design on the tattoo smudges, you print on the wrong side of the paper by accident, or you simply forget to flip your design. If anything happens - do not fret! We will send you a replacement for FREE! We strive to provide world-class customer service for any inconvenience that arises. If you have any questions about this product by Tattify, contact us by completing and submitting the form below. If you are looking for a specif part number, please include it with your message.